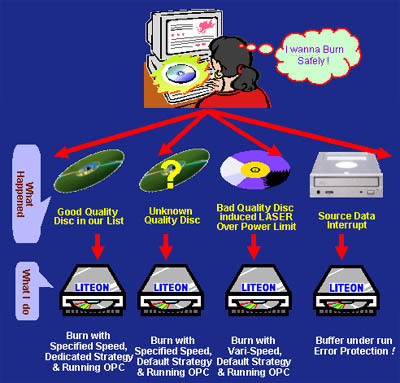 Lite-On was established in 1995 as an optical storage research and production company. Currently, they have over 130 engineers with Master & Ph.D. degrees on their R&D team, and have worked in developing Lite-On's patented anti-vibration mechanical design, advanced circuit design, firmware programming, and performance tuning. 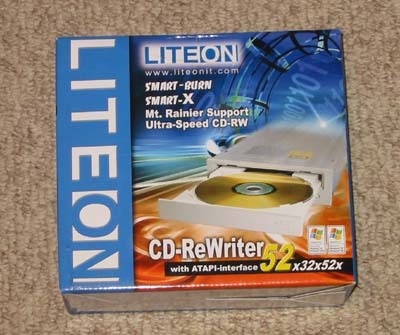 Lite-On is ranked among the top three optical drive manufacturers, and continues to grow as its product lines expand. CD Burning has come a long way since its inception. The first burner that I bought was an HP 8100 4x4x24, and that was fast. Back then, and even as recent as only a year or so ago, speed benchmarks mattered immensely when comparing drives with the same speed ratings, but ever since the advent of the 40x line of burners, speed tests have mattered less and less. With 52x burn speeds, it is not the minor speed differences (a few seconds here, a few seconds there) that matter. What matters is that the quality of the burns stays consistently high when writing at such speeds, and quality is that on which the review will focus - so let's see if the Lite-On 52x32x52 drive is up to scratch! Having not received the retail package (merely the box), I am able to neither photograph nor enumerate the items included in the retail package. The drive itself is slightly different than the other Lite-On drives that we have tested. The front bezel is no longer flat, it is now rounded; additionally, the drive is shorter by about 2 cm, lengthwise. This means that the drive more readily fit in smaller cases with large PSUs or modifications. As you can see, the back of the drive has the standard ATAPI CD-ROM layout, with power, IDE connection, jumper settings, and input for an analog audio cable. Smart-Burn stands for Smart Monitoring & Adapting Recording Technology for BURNing. Unlike some proprietary technologies, Smart-Burn is not just buffer under run technology. It provides an entire method for dealing with poor-quality media, unlisted media, and of course, buffer under-runs. In one case, if the media is listed in the drive's firmware database, it will take its pre-defined strategy for this specific media and use it while burning. In the second case, if the media type is unknown, it will run OPC (Optimal Power Calibration) to evaluate the media and determine the appropriate writing strategy. Third, if the media quality is bad, the drive will run OPC and constantly reevaluate the writing strategy and change speeds over the course of writing in order to adapt to the inconsistent media. SMART-X stands for Smart Monitoring & Adjusting Read-speed Technology for eXtraction. Smart-X works in two ways. First, it adjusts audio or video extraction form CDs to meet the needs of the program using it (for example, viewing a VCD or burning on-the-fly). Second, it checks the media for errors or scratches and slows down to ensure the best possible extraction.